Sc. 8-A 1851 Regular Issue. VF sound used example of SCARCE item. Includes 2003 PSE certificate. Sc. 11 1851-57 Regular Issue. F-VF (position 35-R-1) w/ Steamboat Mail "Forwarding Agent" cancel. Sc. 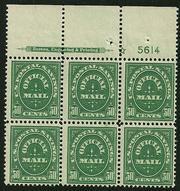 11 1851-57 Regular Issue. (Rare position 47-R-6) F-VF+ brown carmine color. Lines on bust & bottom of medallion is recut. Light June 8, 1857 CDS. Just touches at bottom. Sc. 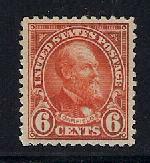 25 1857-61 Regular Issue. F-VF example with 1859 Shakopee, MINNESOTA TERRITORY cancel tied on piece. Sc. 73 1861-66 Regular Issue. Fine used example (Possibly used as a Revenue) Cancel CEC 7-23-63 UNUSUAL ITEM!!! Sc. 85 1868 'D' Grill. VF+ used example with circle of small wedges cancel. 2005 PF certificate. Scarce so nice!!!! Sc. 101 1867 'F' Grill. 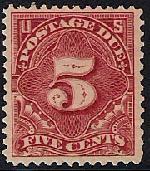 Fine centered stamp with faults. A scarce stamp, nevertheless. Sc. 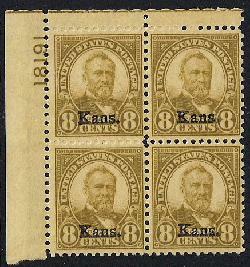 209 1881-82 ABN issue. VF-XF example with out gum. Sc. 251 1894 Regular Issue. F-VF never hinged example. 2004 PSE certificate for strip of 3. SCARCE !!! Sc. 273 1895 Regular Issue. F-VF never hinged Plate # imprint strip of 3. Minor perf. separation in selvedge. Sc. 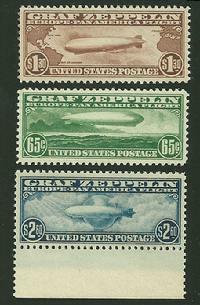 293 1898 Trans-Mississippi Issue Fine hinged example with 3 large margins & cutting in @ the top. Sc. 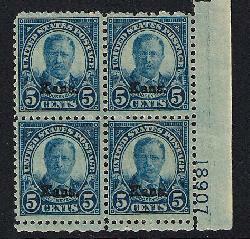 559 1922-25 Regular Issue. XF light hinged example with well balanced margins all around. Sc. 663 1929 Kansas Overprint Issue. F-VF never hinged plate block. Sc. 666 1929 Kansas Overprint Issue. 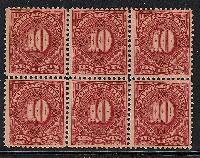 VF NH plate block of 4 (1 stamp with disturbed gum. Bright colored example. Sc. 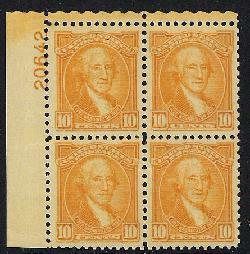 715 1932 Washington Bi-Centennial Issue. VF-XF never hinged plate block. Sc. C-1 1918 Air Mail Issue. 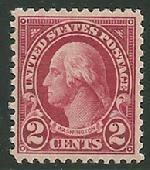 XF never hinged well centered example with post office fresh gum. Sc. Q-12 1913 Parcel Post Issue XF+ used example. Moderately difficult to find nicely centered.